A sink-top instant hot water dispenser connected to a water filter is a wonderful kitchen aid. If you’ve never experienced the convenience of an instant hot water dispenser mounted at the kitchen sink, you’re missing out. A sink-top dispenser can deliver both piping hot and icy cold water. 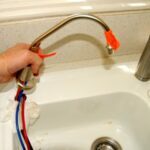 These point-of-use water heaters consist essentially of a miniature electric water heater and storage tank mounted beneath the sink and connected to a small sink-top spout. They are often also connected to water filters, and some models deliver both hot and cold water at the sink. For today’s fast-paced, dinner-in-an-hour kitchens, hot water dispensers are the epitome of convenience, accelerating all kinds of kitchen tasks: preparing hot drinks, soups, gelatins, sauces, and cereals; thawing juices; pre-heating water for cooking; warming baby bottles; even melting wax or purging berry stains from clothing. They take the lag time and the hassle out of these and many other tasks that would otherwise require boiling water on the stove. Though top-of-the-line models may cost $400 and serviceable units can be as little as $100, expect to pay close to $300 for a quality dispenser. Many styles are available, from low spouts with handles you twist to tall, gooseneck units that allow plenty of room for filling tall cups and kettles. Chances are good that you can find a dispenser to match the look of your sink fixtures. Typical finishes include white, black, almond, chrome, satin nickle, and brass. Some units, such as KitchenAid’s and Whirlaway’s, have a twist grip that releases water with a quarter turn. Others, such as In-Sink-Erator’s, have a lever release. Elkay’s spouts, which tout “no lead” construction, have a button on top. Franke makes the smartly styled Little Butler, which has a tall, L-shaped spout and a lever handle. Some manufacturers—Franke and In-Sink-Erator to name two—offer models that dispense both hot and cold water through one faucet. 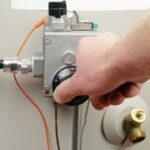 The cold water side can be connected to a chiller, or both supplies can be hooked up to a water treatment system. This type of faucet eliminates the need for yet another spout—the purified cold water spout—at the sink. For sinks that don’t have the needed mounting hole for a new faucet, replacing a purifier spout with one of these is the perfect solution.